Viruses are obligate intracellular parasite. They are reproduced only within a host cell. Viruses lack the enzyme for its replication. It uses the metabolic machinery of the host for its replication. Isolated viruses are only protein-coated particles. They are transmitted from one host cell to another. Each type of virus infects only a limited range of hosts. It is called its host range. Viruses identify their host by a lock-and-key. There are specific receptor molecules on the host cells. Similarly, some proteins are present on surface of the virus. These receptors and proteins are involved in lock and key attachment. Some viruses have broad host ranges. They infect on several species of host. For example, rabies virus can infect number of specks. Some species have narrow host range. They infect only single specie. For example, phage virus infects only E. coll. 1. Penetration: It is the first step of infection. Mechanism of penetration is different in different species. For example, phage uses their tail apparatus to inject DNA into a bacterium. Their tails have special enzyme lysozyme. It breaks the cell wall and cell membrane of bacterium. In some cases, complete virion enters into the host like AIDS virus. to synthesize its new DNA. RNA viruses contain their own enzymes to initiate replication within the host. Host has no enzyme to copy RNA. The virus uses resources of host for viral production. Host provides the nucleotides for nucleic acid synthesis. Virus uses its enzymes, rioosomes, tRNAs, amino acids and other machinery. 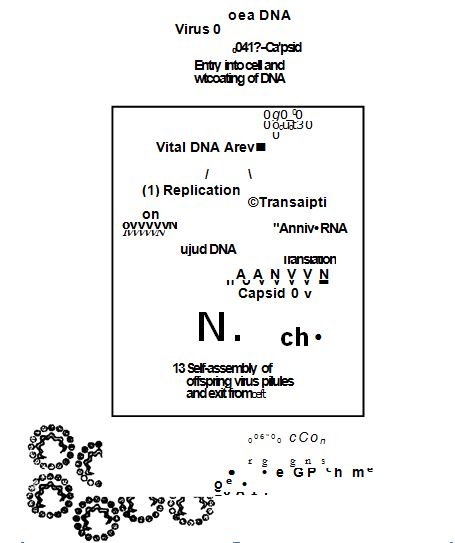 Assembly of virion: Viral nucleic acid molecules and capsids are produced. Their assembly into new viruses is a spontaneous process. This process is called self assembly. RNA and capsomeres of TMV can be separated in the laboratory. If its contents are mixed it spontaneously reassemble itself. Release of virions: Hundred or thousands of viruses emerge from host cell. The host cell is often destroyed in the process. The destruction of host cells causes some symptoms of viral diseases. For example, colds and influenza viruses destroy the mucous membrane in respiratory passages. It causes symptoms of cold and influenza. The newly formed viruses infect other cells and in this way a new cycle started. 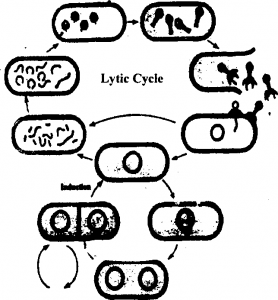 (a)Lytic cycle: In this case, bacteria burst arid release a large number of phage. DNA incorporates in the bacterial DNA as prophage. It remains their in inactive form and replicates with the replication of bacterial DNA. Sometimes, it comes out during process of induction and start lytic cycle. endoplasmic reticulum of host cell to synthesize new envelopes. The viruses budded off from the surface of host cells. Some viruses like Herpes virus derives their envelops from the nuclear membrane of host cell. 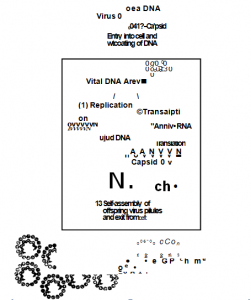 Retroviruses: Retroviruses are RNA viruses. Their RNA enters into the host cells. It is changed into DNA by an enzyme reverse transcriptasc. This viral DNA incorporates in host DNA as provirus. Now it is part of host DNA. It synthesizes new RNA and new capsids new enzymes. Thus many new virions are formed. These virions develop envelops and budded off from the host cells. (a)Horizontal transmission: In this case, virus infection spread from external source to plant. It may spread from leaves to leaves. (b)Vertical transmission: In this case, viruses are transferred from one plant to •other plants by asexual propagation and infected seeds. The Bacteriophage or phage virus replicates only inside the bacterial cell. 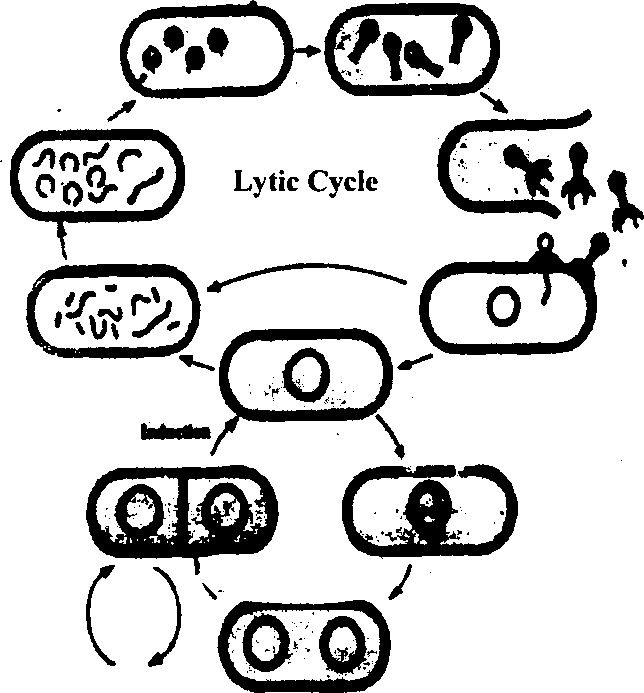 Phage virus shows two types of cycles during its replication: Lytic and lysogenic cycles. the receptor site on the cell wall of the bacterium. Weak chemical union takes place between the virus and the receptor site. Multiplication: The viral DNA starts controlling the biosynthetic machinery of the bacteria inside the bacterial cell. It induces the bacterial cell to synthesize the parts of the virus, protein and DNA. Then virus multiplies to form many new viruses. Approximately 200 new viruses are formed after 25 minutes of the infection. Lysis: Many viruses are formed in the bacteria. The bacterial cell undergoes lysis and bursts. The newly formed viruses are released and infect other bacteria. each daughter cell in all coming generations. Sometimes, the viral DNA detaches from the bacterial chromosome and starts lytic cycle. This process is called induction. The lysogenic bacteria are resistant to viral infection by same or similar phage virus. The phage which causes lysogeny is called temperate or lysogenic phage. The phage posses a gene code for repressor protein. This protein represses the replication of phage DNA in lysogenic cycle. Repressor proteins save the bacteria from lysis.